Victoria Park. East London. Victoria Park Restaurants. Florists. Victoria Park, is in the heart of London's East End. Victoria Park Village is a delightful 'village' area situated next to Victoria Park (the oldest public park in Britain - built in 1842). 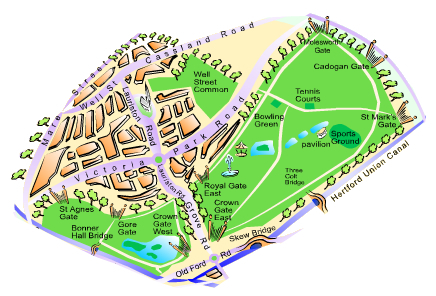 This is the nearest 'village area' to the London 2012 Olympic Park and Village which is on the cusp of Tower Hamlets and Hackney. With the focus around Lauriston Road and Victoria Park Road, there are designer boutiques, specialist interior shops, cafes, pottery and gift shops, hair and beauty salons, pubs, bars and restaurants. Their close proximity to the park gives the feeling of a true East London village.